Come join us for Cade's 5th Birthday Bash! Some great prizes to be won. This event will begin on June 22nd and run through July 6th. Prizes are still being worked out, but there will be one winner/prize. Bloggers receive 1 free link for posting this announcement post. 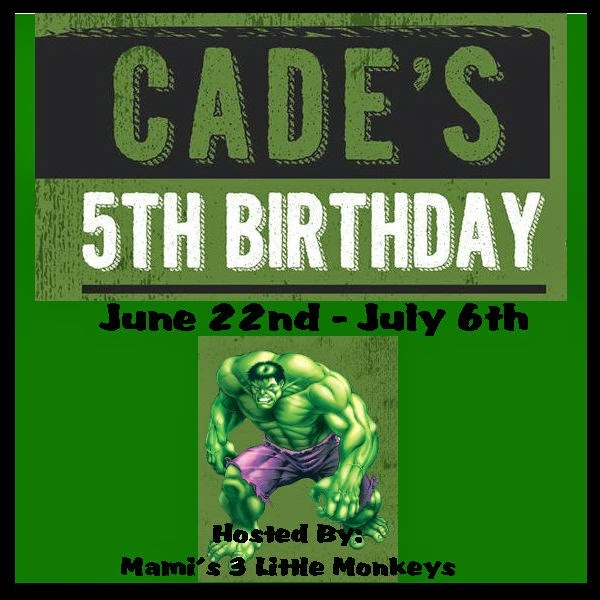 If you do not wish to post the announcement then you may send $3 via paypal to mamis3littlemonkeys@yahoo.com. You will still receive your free link if the fee is paid instead. Receive a 2nd free link for posting the giveaway on time, once it's sent out and also for promoting the giveaway at least 3 times per week via Facebook, Twitter and other social media networks. This is required. Remember the more you promote the event the better it will make the event for everyone involved. If you only want your link on the entry form w/o having to promote or post the giveaway, you may send $15 via Paypal. I am looking for at least 2 co-hosts for this event. The cost of the co-host event will be $10 and you'll receive an additional 5 links, making a total of 7 links if you have completed the above two free links. Each co-host will also have a link back to their blog as well as a follow/word page. Additional links available for small fee. Please see form. Grab the announcement post HTML here.